Non-transparency, d ouble standards, long wait. Facing this accumulated unpleasantness, the subject of debate, almost certainly, is the so-called double blind peer review. Given a plethora of critical and less critical considerations throughout academia, there is no need to rehash all the pros and cons here; neither do I want to make a general statement on digital humanities or digital medieval studies. Indisputably, a thorough peer review is capable of improving any scholarly article, and even a rejection does not necessarily put an end to attempts at publishing a specific paper. However, at a time when scholars are advised to publish in so-called high-impact journals only, in order to collect research points to get more money and better positions, ‚peer review‘ has grown to the ultimate advertising slogan for any journal in vague fear of losing relevance. Within the field of medieval studies — the playground of a range of specialists — the overall number of journals has always been manageable. Furthermore, the traditionally strict marking of areas of responsibility makes it rather tricky to formally cross community borders by publishing in a journal tied to a different discipline than your own. Thus, it comes as no surprise that medievalists often face a very small number of options for publishing. Under the last decade, to be sure, many well-established publishers have discovered the possibility of putting their journals online. Yet, that does not necessarily imply an increased number of annual issues or even more articles per issue. Even if a paper has successfully passed the first or second review, awaiting publication (or at least galley proof) can easily stretch out over a year or two, due to a long queue of other papers. However, a growing number of highly motivated doctoral candidates, postdoc researchers, and assistant professors are populating the grounds of medieval studies, eager to contribute to their field’s maintenance and development. Moreover, most academic job applicants are demanded to submit a whole bunch of their ‚most important‘ publications. To put it in a nutshell: in the humanities, the quantity of academic output is more important than ever. 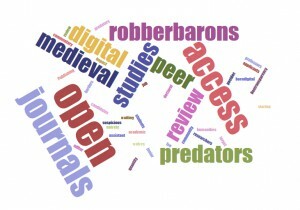 In recent times, born-digital open access journals have become an alternative to handle this quantity: they are often less cleaved to the traditional restrictions of printed media, and open minded towards new types of peer review such as open peer commentary. Given the undeniable enrichment of medieval studies through such journals, what is the purpose of my brief contribution? 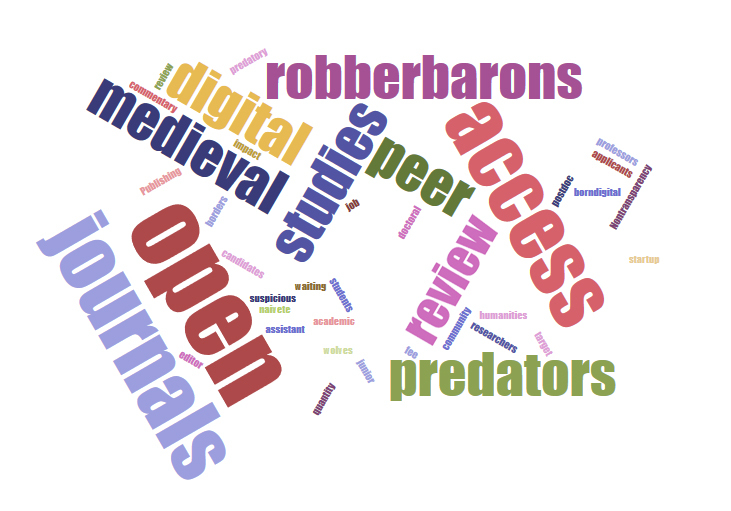 Most medievalists, I assume, have subscribed to several newsfeeds, providing them with updates on virtually any topic within the field, including calls not only for papers, but also for reviewing and editing start-up journals. Some of these offers are quite tempting — all journals have started from scratch. Yet, all is not gold that has key words such as ‚humanities‘, ‚digital‘ or ‚medieval‘ in its title. Occupying a popular term of medievalism and social criticism, I want to draw medievalists’ awareness to the growing number of twenty-first century robber barons on the publishing road. Being a global phenomenon, the problem of so-called predatory open access journals is already well-aware at many universities and research facilities, but, as far as I can see, still somewhat neglected (at least) within German academia. What is it all about? As mentioned above, it is certainly a good thing to be able to choose among several journals for publishing, and a journal offering prompt peer review and quick publishing is all the more welcome. But what if the author is informed about a fee to pay only after publishing? All the more, as a brief investigation indicates that such a fee ex post can easily range from several hundred to several thousand dollars per paper. And what if an established scholar never comes to know that she or he promotes a journal by being listed as a member of the editorial board for example? A pioneer in uncovering such unethical (though not necessarily illegal) publishing behaviour is Jeffrey Beall, academic librarian and associate professor at the University of Colorado (Denver), running the website „Scholarly Open Access“. 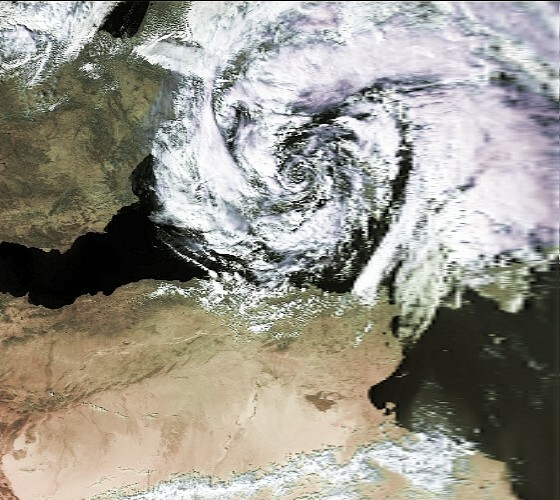 Nevertheless, it is hard to define and assess the complex phenomenon we are talking about. Where is the line, one has to cross to be on “the dark side of publishing”? So far, medievalists do not seem to be a priority target of dubious journals and their instigators. However, according to Beall’s 2015 „List of Predatory Open Access Publishers“, the number of potential, possible, and probable publishers from the dark side has grown from 225 in 2013 to 693 in 2015, with the number of suspicious journals growing from 126 to 507 in the same period of time. This list can of course be subject to debate, but the emergence of more and more dubious journals is not to be put aside. The less so because Beall claims that „many of those publishing in predatory journals are graduate students and junior faculty who lack the experience to recognize the predators. The publishers have learned to exploit this naivete“. Here, we are back at the initial point. And from this point of view, it is only a matter of time before even medievalists have to deal with this new type of wolves in shining armour. Cf. van Nahl 2014, „Odyssee 2.0? Wege und Irrwege digitaler Publikationen in den Geisteswissenschaften“, in Jahrbuch für Internationale Germanistik 45/2, pp. 129–136; van Nahl 2014, „Eine schöne Nebenbeschäftigung? Perspektiven einer altertumskundlich-mediävistischen Wissenschaftsgeschichte 2.0“, in DhdBlog – Digital Humanities im deutschsprachigen Raum 10/2014, http://dhd-blog.org/?p=4170 [June 12, 2015]; van Nahl 2014, Die Flüchtigkeit der Information. Wissenschaftsgeschichte im digitalen Zeitalter (Transformationen von Wissen und Wissenschaft im digitalen Zeitalter 3), Berlin; van Nahl, „Digital Medieval Studies“, in The Ashgate Research Companion to the Medieval Saga, ed. Ármann Jakobsson & Sverrir Jakobsson, Farnham (Surrey), forthcoming. One might, however, ask whether the term ‚predator‘, suggesting a kind of evolutionary phenomenon beyond human control, is appropriate. Butler, Declan 2013, „Investigating Journals: The Dark Side of Publishing“, in Nature 495, pp. 433–435, http://nature.berkeley.edu/~sewolf/FLUXNET/Miscellaneous/Dark-side-of-Publishing.2013.NatureNews.pdf [June 12, 2015]; cf. further Haug, Charlotte 2013, „The Downside of Open-Access Publishing“, in The New England Journal of Medicine 369/9, pp. 791–793, http://www3.med.unipmn.it/intranet/papers/2013/NEJM/2013-02-28_nejm/nejmp1214750.pdf [June 12, 2015]. Elliott, Carl 2013, „On Predatory Publishing: a Q&A with Jeffrey Beall“, in The Chronicle of Higher Education 6/2012, http://chronicle.com/blogs/brainstorm/on-predatory-publishers-a-qa-with-jeffrey-beall/47667 [June 12, 2015]. Danke für den Hinweis, da kann man in der Tat ein wenig stöbern. ‚Medieval Studies‘ liefert übrigens zumindest bei der Artikel-Suche rund 450 Treffer. Für Facebook-Nutzer: In der Gruppe „Scandinavian Scholars“ (2000+ Mitglieder) sind dieser Blog-Beitrag sowie das Phänomen von „false open access journals, predatory publishers and fake seminars“ erneut aufgegriffen worden (https://www.facebook.com/groups/255386821245033). Jüngste Verlinkung des Beitrags bei der Max Weber Stiftung: https://mws.hypotheses.org/author/janvannahl – weitere Kommentare zum Thema gerne gesehen! Mittlerweile gibt es außerhalb des Blogs einige bemerkenswert diametrale Rückmeldungen, von „Jan Alexander van Nahl beschwört ohne Not die Gefahr unseriösen Open-Access-Publizierens auch in der Geschichtswissenschaft“ (http://archiv.twoday.net/stories/1022449625/) – wobei medieval studies für mich nicht auf die deutsche Geschichtswissenschaft beschränkt sind – hin zu „Not news to Americans, but useful, as author says, to explain for Germans and medievalists. A serious issue“ (https://twitter.com/CitizenWald/status/611192863481671680). @Jan Keupp & Jan Alexander van Nahl: Erstmal herzlichen Dank für die Komplimente für unseren Blog, wir tun unser Möglichstes – ohne uns primär als open-access-journal zu verstehen. Aber zum Thema: Mir ist im Bereich der deutschsprachigen Mediävistik bisher auch weniger aufgefallen, dass Angebote dubioser Online-Zeitschriften auftauchen. Allerdings hatte ich die Erfahrung nach einem (englischsprachigen) CFP in jüngster Zeit, dass quasi postwendend Angebote von (meist) englischsprachigen Verlagshäusern eintrudelten, ohne Nachfrage zum Konzept, zu Autoren, zu Bildern, zur Beitragszahl – alles Dinge, die man von einem seriösen Verlag erwarten müsste. Das Herz hüpfte trotzdem kurz höher, bis schnell feststand, dass die nur so ähnlich klangen wie die „University Press“ sehr renommierter Einrichtungen auf der britischen Insel. Ein wenig nachrecherchiert und schon stand fest, dass das eher Ramsch-Verlage waren. Sicher, es gibt auch deutschsprachige Publikationsorte mit – sagen wir es vorsichtig – geringerer wissenschaftlicher Reputation. Aber die aggressive Werbung dieser „publishing houses“, die mit Cambridge, Oxford etc. im Namen jonglieren, scheint mir doch verwandt mit den hier porträtierten Räuberbaronen zu sein. Meine Frage an die mediävistische Community: Ist das eine typische Erfahrung? Die angedeutete Ausweitung hin zu Sammelbänden und Monographien würde mich ebenfalls interessieren. Nicht zuletzt wird ja auch von etablierten Verlagen bisweilen ein stattlicher Druckkostenzuschuss gefordert. Und generell zeigt eine Google-Recherche, dass ‚aggressive‘ publishing houses durchaus ihren Weg in die Publikationsverzeichnisse von Universitätsangehörigen finden. Es scheint sich da eine Gemengelage herauszubilden, die die rasche Trennung nach seriös/unseriös zunehmend erschweren könnte. Betrifft dieses Phänomen die deutsche Mediävistik tatsächlich? Ich würde hier nach wie vor behaupten, dass ein Gutteil der substantiellen Veröffentlichungen in Sammelbänden stattfindet und Zeitschriften keine substantielle Priorisierung erfahren. Im Gegenteil: Einige Herausgeber klagen über einen spürbaren Rückgang an Zuschriften. Davon unbenommen bleibt oftmals ärgerlich die lange Frist bis zur Drucklegung. Hier sehe ich das tatsächliche Potential von Online-Veröffentlichungen, die rasch und flexibel auf aktuelle Debatten reagieren können. Dieses Metier nicht in die Hände akademischer Parasiten fallen zu lassen, wäre eine kollektive Aufgabe. Ich zweifle aber daran, dass der Ernstfall in Deutschland in absehbarer Zeit eintreten wird. Hinterfragen müsste man eher die Kalkulationspraxis einiger wissenschaftsnaher Verlage. In der Tat fußt mein Diskussionseinwurf auf Erfahrungen, die ich in den letzten Monaten im Ausland gemacht habe – sowohl hinsichtlich der Taktiken einiger ‚Herausgeber‘, als auch der Gewichtung von Zeitschriftenbeiträgen in den Humanities. Vor allem war ich verblüfft, wie schnell man diese Erfahrungen machen kann. Primär vor diesem Hintergrund habe ich die These formuliert, dass der akademische Nachwuchs auch in Deutschland in den kommenden Jahren mit einer wachsenden Zahl an ‚Verlockungen‘ umzugehen lernen muss – unbesehen der Frage, ob daraus „substantielle Veröffentlichungen“ erwachsen (sollen). Und ob sich die deutsche Mediävistik dem Eindringen zunehmend wuchernder – und zugleich lernfähiger – akademischer Parasiten mittelfristig wird verschließen können, das ist eine Frage, die hoffentlich weitere Einschätzungen motiviert! Vielleich eines der besten Argumente für Blogs wie diesen, der redaktionell sorgfältig betreut die Veröffentlichung wissenschaftlich solider Texte zulässt und zugleich eine Vernetzung auf mehreren Kanälen der social media vornimmt. Vom Konzept her scheint mir das jedem drittrangigen open-access-journal überlegen zu sein!